Class 205-E is beginning to study Egypt! We broke into groups and each group studied a different part of Egypt. 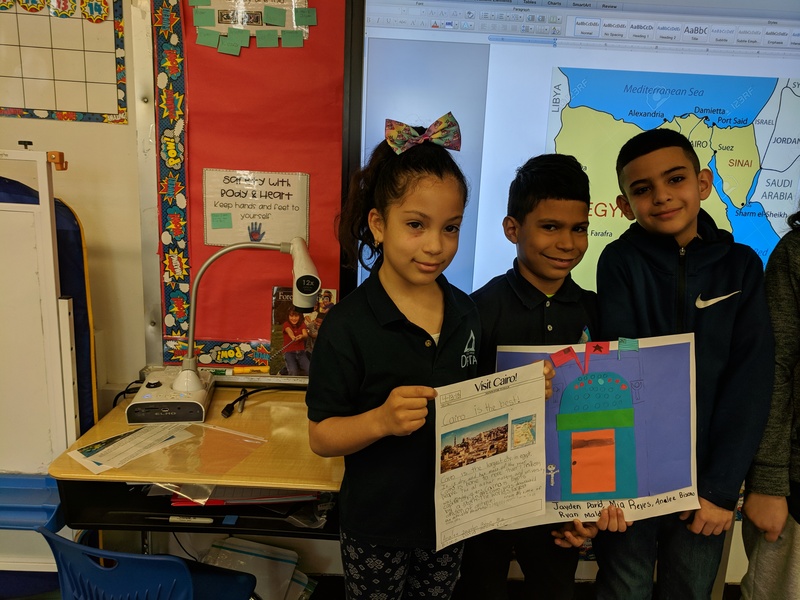 One group studied the city of Cairo, one studied the city of Alexandria, one studied the city of Giza, and one studied the Egyptian Flag and the entire map. Each group studied their topic by reading books, articles, and looking at pictures of their city/country/flag. Using a note taking strategy of choice, they took notes on their topic. Together, the group took their notes and turned it into an advertisement of all the great things about their aspect of Egypt. Finally, each group worked together to make a collage of their city/country/flag. Previous Entry:Third Grade Is Catapulting Away!